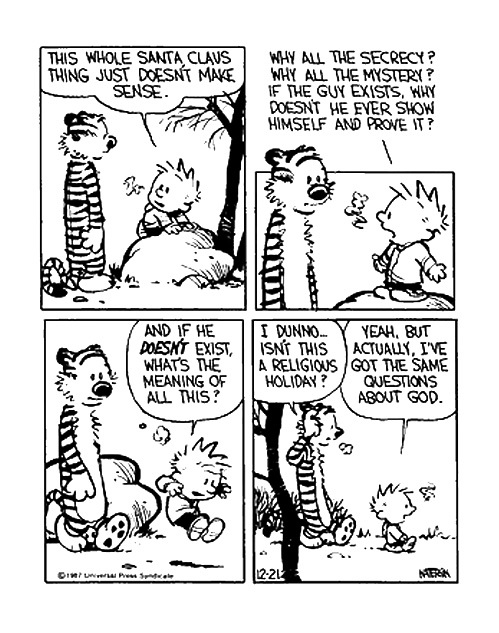 ...not because of the questions that Calvin found to be common between Santa Claus and God, or even the fact that he has questions about God. What troubled me is the fact that he has questions about Santa Claus. If someone had not told Calvin that Santa Claus existed, he would not even have such questions about Santa Claus. I want to talk this week about two important things that Watterson has illustrated (...unintended pun left for your enjoyment) for Christian parents. The primary reason for Calvin's confusion is because he has been told by his parents (and probably the media) that Santa Claus exists, yet there is much mystery (his own words) about this figure. To most kids, their parents are authorities regarding reality. If the parents say that Santa Claus exists, it must be true. But when someone else, who they also trust as an authority on reality, tells them otherwise, they have a conflict that they need to resolve. Regardless of what "evidence" either side provides for their case, if the child chooses to trust the authority that is not the Christian parent, that child's trust in their parents' judgment just began to dwindle. As magical as Santa Claus may be for a child, if we (as Christian parents) tell our kids that he exists, we (not just they) are in for a big surprise when they discover that their parents had been knowingly telling them something untrue (lying). Why should they believe us about the existence of another character that the world tells them is fictional also (God)? If we wish to be good ambassadors for our children, we need to keep their trust in us as solid as we can. Anytime a parent lies to their children, they surrender the right to be trusted by their kids in the future*. The formative years is not a good time to be playing with their concepts of reality- it will set them up for a life of being skeptical of authorities (including God) if we do. 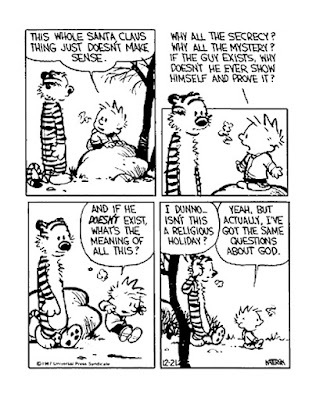 Of course, Calvin may not be being influenced by other authorities in his life, but he may just be a deep thinker (as Watterson has designed his character- more on that in a second)- he's unwilling to accept something on blind faith. He wants to think through things. He wants to investigate implications of ideas and determine if those implications are present in reality. Inherent in Calvin's questions is, "how?". I've been around my nieces and nephews long enough to know that "Why?" is their favorite question when they're young. For those in whom curiosity runs deep, that question continues into their teenage years and also becomes more clearly articulated as "Why and how?" We don't get freaked out when a small child asks us why we cook dinner or why rocks are here. We don't mind if a teenager asks, how a computer works or how we can expect them to do well in school. Likewise, when the deeper questions come- about God, philosophy, and Christmas- we can't freak out. When our kids ask us about the more mundane things of life, we do our best to provide them with a correct answer. We need to do the same when they ask the questions with eternal consequences. It is clear that Watterson designed Calvin's character to be a deep thinker. If we truly believe that God is the designer of the universe and of our children, we must recognize that their desire to think things through comes directly from God. When I was a kid, many simple things filled me with wonder: the design of a leaf, the sounds of a stream, the jack-in-the-box (that might have just been adrenaline). Unfortunately, in my older age, I have lost a lot of sense of wonder of those things. However, that it so that I can focus on the wonder of other things. Specifically, a youngster's ability to think (or not think). For the ones who do, I recognize that they are using the mind that God gave them; I engage them and encourage them to think even more deeply about the everlasting things of reality. For those who don't think (after I've gotten over the wonder of their not using their mind), I look for ways to make them think. It is an exercise for my mind, and when they do engage me, the thrill is magnificent. As parents (and aunts, uncles and grandparents), we need to be prepared to use the minds that God gave to us, and we need to be an example to our kids on how to use theirs. We need to give them room to explore, to know God on their own, to choose for themselves if they wish to follow their Creator or not. This is not a choice we can make for them, and our inability to answer tough questions (or to refer them to someone who can) or unwillingness to give them room for doubt will cause them to doubt our own willingness to investigate and search for what is actually true. If we don't wish for our kids to have a blind faith, we can't exhibit it to them. Knowing the character of Calvin, he would be absolutely ecstatic if his parents engaged him more often with the deeper issues of life. He is frequently challenged by the other characters in the strip regarding mundane things but never on the more important issues such as God and eternity. If the child in your life is a thinker, you have the ability to connect with them in a way that few your age are willing to. It will establish a relationship of trust. Part of being an ambassador for Christ, involves our character. When kids look to us for guidance, they are telling us that they trust our character. As parents let's not undermine that trust by starting them out believing in Santa Claus; and as friends and family members, we can't jeopardize our future relationship of trust by perpetuating the same falsehood. Now, there are many Christians who do not have a problem with the Santa Claus tradition and many of them even use it in their own families. I want to make a few distinctions in what I am saying and recognize some merits in the Santa Claus tradition to avoid any possible confusion. First, I'm not saying that Christians cannot use Santa in their traditions at all. I have no problem with it as long as there is the understanding with the kids that Santa is a fictional character. Its very similar to my stance on the Easter Bunny. When I was young, I love going on Easter egg hunts, and today love putting them on for my nieces and nephews. The tradition is carried on with the kids understanding that bunnies cannot lay eggs, and that the "Easter" bunny is not real anyway. It does not take away from the enjoyment. The primary difference I see between the Easter Bunny and Santa Claus is that the tradition behind the Easter Bunny does not have the ability to influence the behavior of kids. The Santa Claus tradition only has that effect if the kid believes that Santa is real, though. So, the tradition can still be used, but it will not have the influence that it is intended to in the secular world. For the Christian family, this is not a big sacrifice. We have the love of Christ that should influence our behavior, not the anticipation of getting something we want. Santa cannot take into consideration intention of the heart (which could very well be the "candy machine" mentality). Santa cannot know if the child is just trying to manipulate him or if he actually is "good". Calvin makes this point very clear...but Hobbes sees right through it and highlights Santa's limitation. Christians can still get the implications that the Santa Claus tradition is supposed to have, while still understanding Santa Claus as a fictional character. Christianity has an advantage, though. The true heart of the child is on display. When the parent knows the heart of their child, they know them more intimately and can guide them in more influential ways. Second, many Christians use the tradition of Santa Claus as a cultural illustration of Christ's love. They make the connection between Santa Claus selflessly giving gifts to everyone. This points to how we should be more selfless and put others before ourselves. Some take it another step: Santa gives regardless of the condition of your heart. And still others build upon that theme by pointing to the ultimate selfless act that Christ did on the Cross- He gave His own life that we might live. The thought-provoking question posed after that is this: if Santa is selfless to give material things, how much more selfless is Christ to give his life? Every one of those connections is very powerful and may go a long way to help explain Christ's love to a child. The beautiful thing is that none of them depends upon the child believing that Santa is real. For the more thoughtful kids, the fact that Santa does not exist may weaken the connection, but then the real person whom the Santa Claus tradition is based upon (St. Nicholas) can be appealed to. Christians have nothing to lose by being up front about Santa Claus to their kids. In fact, my second point demonstrates a potentially powerful way to make the love of Christ very personal to them. Yet, if we are telling them that Santa Claus is real at the same time, and they discover he's not (apart from us), they may project that revelation onto Christ also. This important distinction needs to be made. The longer that we allow them to believe that Santa is real, the less control we have over when they discover the truth and how they will react to it. Their trust in us is in jeopardy, and more importantly their trust in God is in jeopardy. Enough About the Parents- what about the kids and their friends? Of course, our kids live in a world populated with other kids who believe the lie. If we are to tell our kids that Santa is not real, we have to follow it up with some caution when talking with their friends. This puts forth an interesting moral dilemma: telling the truth vs. perpetuating a lie. At first glance, the choice seems obvious. Unfortunately, as we consider consequences, the choice becomes less obvious. Let me explain. Things get a little more hairy when the parents are Christian- are we to show another child that their Christian parents are not to be trusted? What if the parents are not Christian- are we justified in potentially damaging their authority with their kids? Also, many parents want to use Santa as a tradition for the Christmas season and may or may not expect their kids to find out, or they may tell them on their own in their own time. If our kids tell these kids the truth, it is likely to cause unintended consequences that may neutralize our good intentions or even backfire completely. It appears as though some compromise and risk may be involved in doing what appears to be obvious. We must instruct our kids to not go trumpeting the news- this may cause unnecessary confusion, distrust, and skepticism before its proper time. They need to only give it out if asked directly. This seems like a good beginning point- exceptions may be made depending upon circumstances that allow for more vocal approaches. Greg Koukl promotes, in his book Tactics: A Game Plan For Discussing Your Christian Convictions, asking questions to draw out logical conclusions. Our kids are already good at asking us questions, why not have them redirect those questions towards other kids? Our kids are never too young to learn to ask each other thought-provoking questions. Even if asked directly about Santa's reality, a child could direct their friend to discover the truth on their own by asking questions. The truth must be given in a manner that the person is likely to accept it. But we must provide it in a manner that will not damage appropriate relationships with other authoritative figures. It is unwise to compromise the content of what we say, but we it is imperative that we change our delivery of the truth based on the circumstances. This is yet another opportunity to teach our kids to be ambassadors for Christ. If we, as parents, exhibit careful thinking and action in our communication of the truth to our children, they will follow in our footsteps and do the same for others. Should Christians Invite Santa Claus to Christmas? *Thanks to my pastor, Craig Price, for that little nugget of truth.